One tell-tale sign of good music is that it has the ability to transport you somewhere physically, mentally or spiritually. 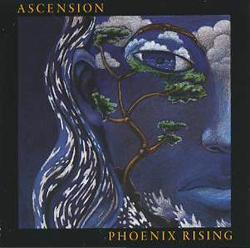 Ascension by Phoenix Rising aims for and succeeds at the latter. It’s an album that is peaceful, serene, and uplifting. According to the album’s liner notes, the seven songs on Ascension are organized around the seven chakras. For those who are not familiar with this concept of energy centers in our bodies, understanding chakras is not essential to enjoying the music. The duo behind Phoenix Rising, Wendy Loomis and Monica Williams, only want the listener to take away that these songs allude to the idea of our own energy’s ability to ascend to a spiritual plane. Beginning with track one, named “Seed,” through the final track, “Ascension,” the music takes the listener on a journey. It has a wonderful quality of not becoming just background music but of creating a sonic space that is conducive to meditation, yoga and deep relaxation. In other words, the music is similar to a vessel that each individual can steer to any internal place. Intertwining melodies from piano played by Loomis and flute played by Williams create the backbone of every song. Guest musicians on each track give the album an international sound with a variety of instruments, including Swiss hanging drums, Spanish and Middle Eastern-style guitar and even Bolivian goat hoof shakers. All tracks are instrumental with the exception of “Unspoken,” which features Irina Mikhailova, whose voice lends a wistful and reverent quality to the song. In explaining the inspiration for the album, Loomis and Williams wrote in the liner notes that they wanted to “create a CD that had the power to help people relax, de-stress and energize with positive vibrations of gratitude for this life.” There is no doubt that both women are accomplished musicians and have created a beautiful album. The music is at times uplifting, but the album at times teeters toward mournfulness and uncertainty. Perhaps that’s just an inherent aspect of a phoenix, however. Before rising, one must go through darkness. As Ascension shows, there’s brilliant sounds waiting for us on the other side.